This was announced in this year's Berlinale; exciting news about a script I've been working on for the past years. If all goes well, it'll be shooting later this year. I'm happy to tell you that Netflix has bought the international screening rights to a TV series I've been working on for the past couple of years. The deal was announced at the Gothenburg film festival and reported by Variety. 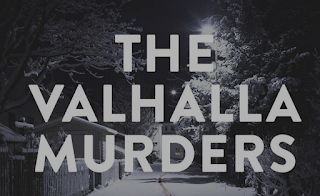 The series is called The Valhalla Murders and is currently filming. It will premier in Iceland in December, and be on Netflix sometime in 2020. 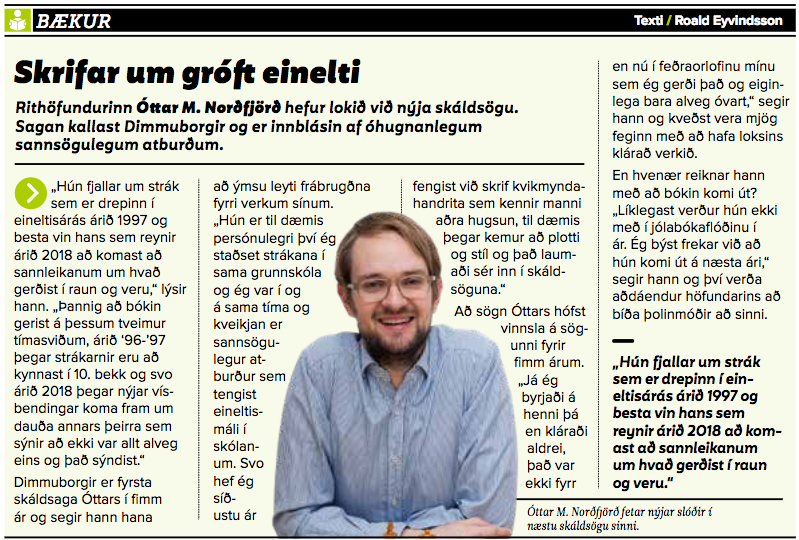 I've become a columnist for the Icelandic weekly-newspaper Mannlíf, writing column every few weeks. It's a fun new job, not too stressful, where I get to express my opinion on whatever topic I see fit. My first column was about Icelander's obsession with exercising outside in the cold, while I like taking it easy inside instead. 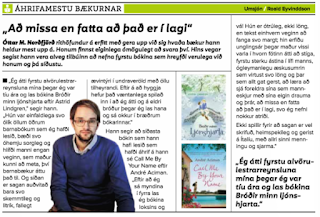 The column is here and in Icelandic. 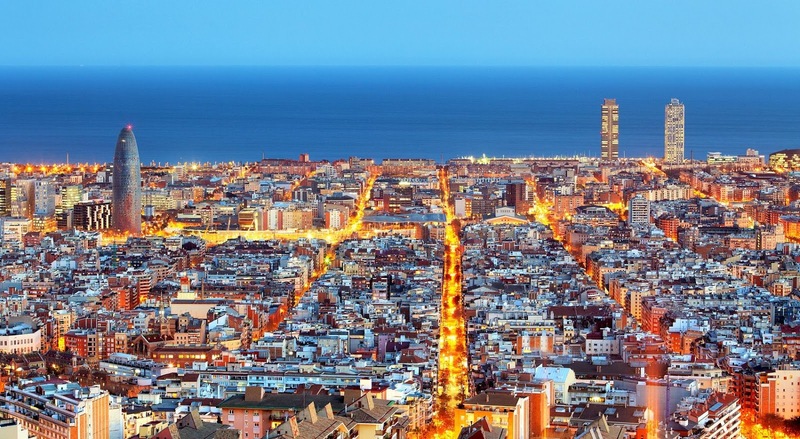 I did an interview recently, in Barcelona, with a Spanish writer/journalist who lives in Iceland. 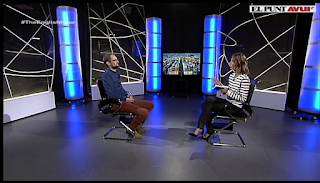 The interview is in Spanish and can be found here. 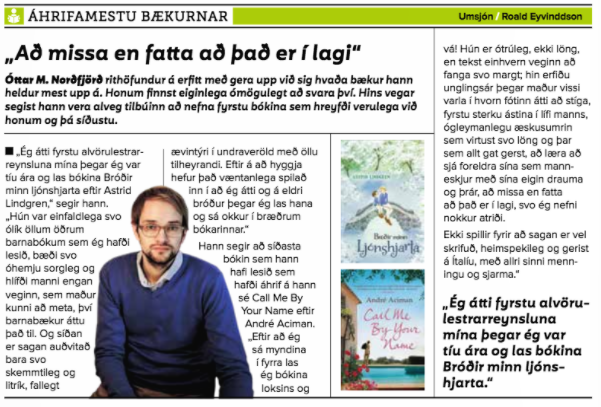 I was in a small column in the Icelandic newspaper Mannlíf about my favorite books, or those who've influenced me to most. 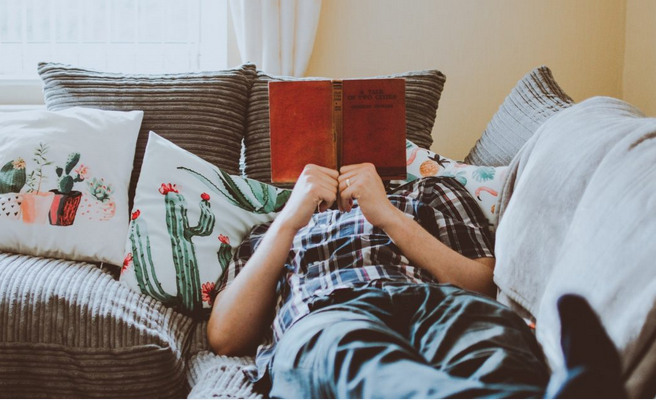 Since it's impossible to answer, I named the first book that I remember affected me, and the last one - The Brothers Lionheart by the amazing Astrid Lindgren, and the fantastic Call me by your Name by André Aciman. I've finished my next novel. I started it around five years ago, but had to put it on ice for various film projects. However, I finally managed to finish it the other day and hope it gets published next year. 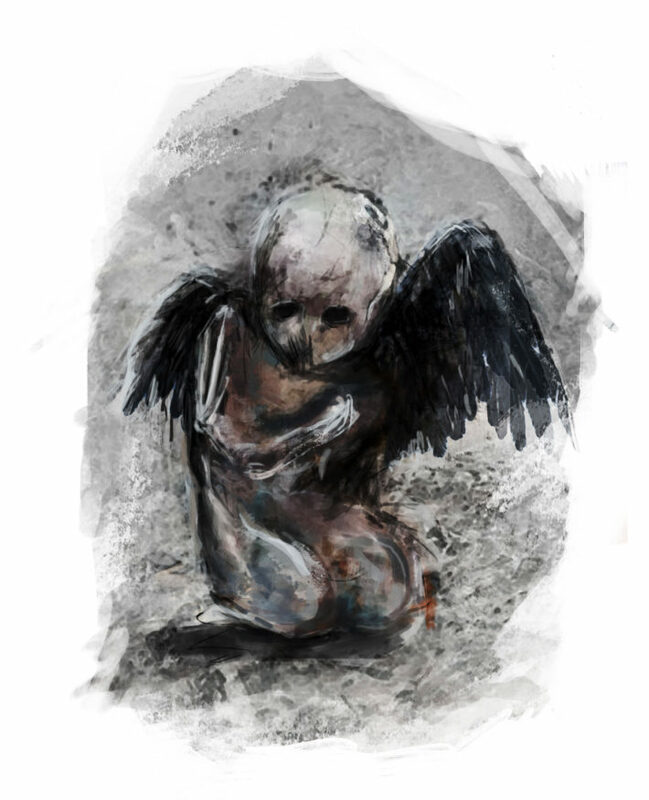 It's in Icelandic and called Dimmuborgir (Dark Cities), inspired by true events of a bullying case in Reykjavik in the late 90s. It's a coming-of-age thriller. The title comes from this mysterious but beautiful place. 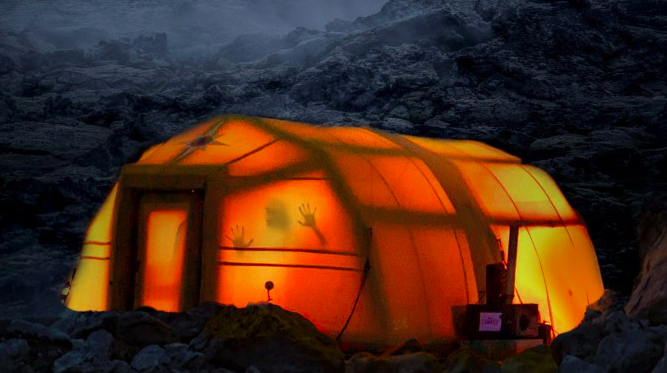 "The Valhalla Murders produced by Iceland’s Truenorth for RÚV was granted NOK 2.5 million. The 8x50’ crime show is created and directed by Þórður Pálsson from a screenplay by Margrét Örnólfsdóttir (Trapped 2, Prisoners), written in association with crime author and poet Óttar M. Norðfjörð. Icelandic born police profiler Arnar who lives in Denmark, is asked to go back to his native country to investigate the first serial killer case. He teams up with the local senior inspector Kata who resents his arrival, as she is the lead detective on the case. The murders don’t seem to have much in common until they connect it to a home for troubled boys dated back to the 1980’s. In the title roles are Nína Dögg Filippudóttir (Trapped, Prisoners) and Björn Thors (Prisoners). Top crew personel include production designer Heimir Sverrisson (Adrift, The Oath), DoP Arni Filippusson (Prisoners, Either Way), and Bafta award-winning editor Valdis Oskarsdottir (Eternal Sunshine of the Spotless Mind, Prisoners). 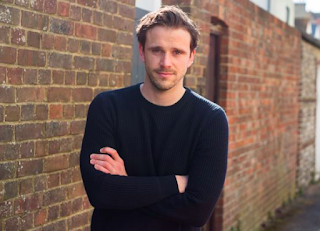 The series is produced by Iceland’s Kristinn Thordarson and Leifur B. Dagfinnsson of Truenorth, with David Oskar Olafsson of Mystery Production. DR Sales handles world sales. Filming is set to start on October 9, 2018 with a delivery in the fall 2019." Here's an article in Danish about DR, the Danish Broadcasting Corporation (produced TV series like The Bridge, The Killing). It's handling the international sales for the TV series I'm writing, The Valhalla murders, and that's already been sold to 12 countries, according to DR Sales. A TV series I've been working on for over a year with some very talented people got a production grant from the Icelandic Film Center. 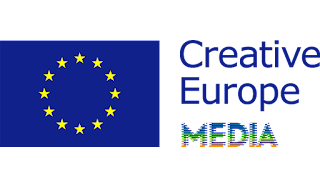 The Icelandic Broadcasting Service (RÚV), the Danish Broadcasting Service (DR), and a few other international TV channels are already on board. 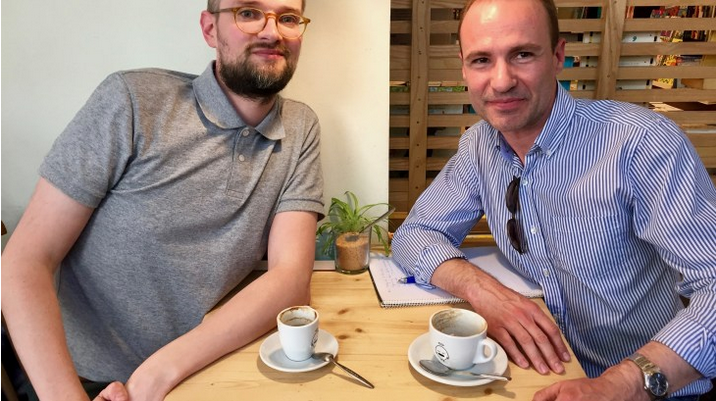 The grant is 50.000.000 Icelandic Krona, or around 410.000 Euros. 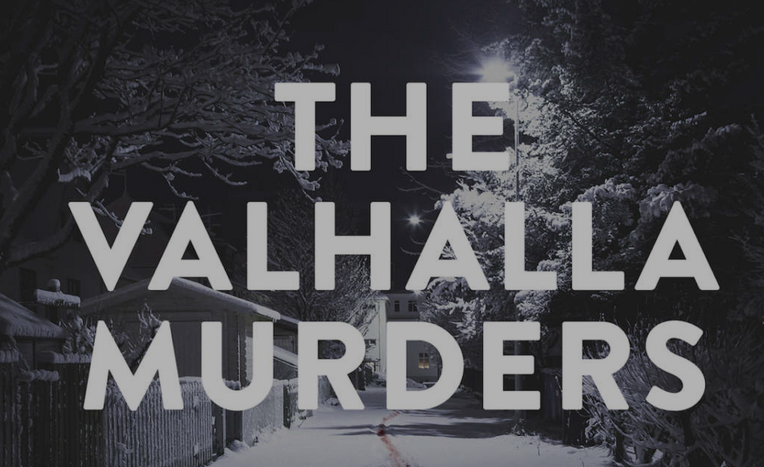 The series, titled The Valhalla Murders, is planned to go into pre-production in May, and start shooting in August. Very excited about this! My film project UNA (Repetition in English) has been honored with a production grant from the Icelandic Film Center. It's 110.000.000 Icelandic Krona, or over 900.000 Euros. The director is Marteinn Thorsson, and shooting is planned to start early next year. Truly great news! Since I live in Barcelona and have been following the situation here closely, I've been in various interviews in Iceland about the Catalan crisis. 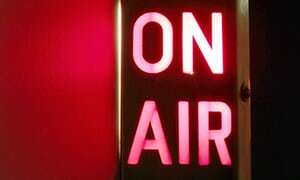 Here are some of them: In the TV news on Channel 2, in RÚV, In MBL, and a radio interview in X-ið. 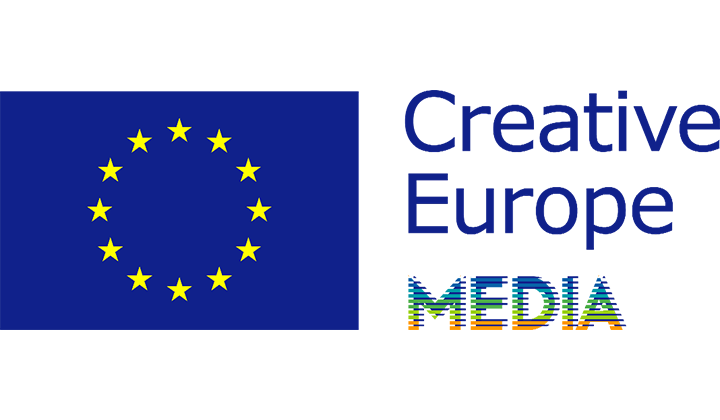 I'm happy to announce that my horror film project, RECURRENCE, recently received a 50,000 euro development grant from Creative Europe Media. The fee will go into further development of the project, which I hope will go into shooting sometime in the near future. Two of my film projects have been chosen to participate in this year's Strategic Partners in Halifax, Nova Scotia, that takes place from 14th to 17th September. 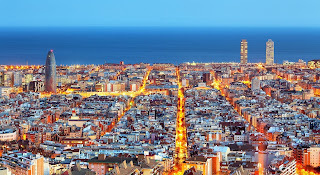 It's a big venue where film projects are introduced to possible buyers, sales agents, financiers and film commissions from around the world. Very honored. Recently a project I'm working on with producer/director David Oskar Olafsson was granted the first screenplay grant by the Icelandic Film Centre. It's a psychological thriller called Midnight, takes place in Vancouver in the 80s, and is about a woman who starts working as a late night radio DJ. Can't say much more at the moment - stay tuned. I haven't checked in for a while, been busy working on the TV project The Valhalla Murders. 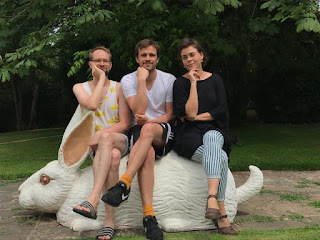 About a month ago, I spent a week in Canet de Mar on Costa Brava with my two friends (director Thordur Palsson and writer Margret Ornolfsdottir), where we mapped out a few episodes of the Nordic noir thriller. Hope to bring some news about the project, or some others, soon! 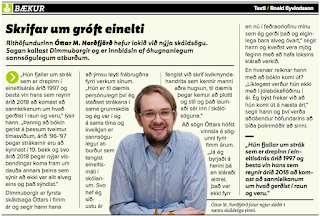 Today in Icelandic newspaper Fréttablaðið, there's an interview with director Thordur Palsson about an original TV series I'm working on with him and a great team of others. It's called The Valhalla Murders and might shoot this fall if everything works out. More later. Two of my projects were announced in the Berlinale this year. 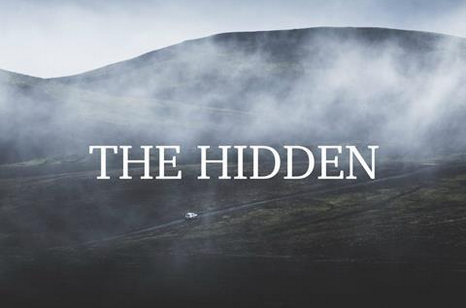 One is my horror thriller The Hidden that's currently casting in London, possibly being shot next fall. The other one is a TV series called The Valhalla Murders. You can read more about the projects in Variety and ScreenDaily.